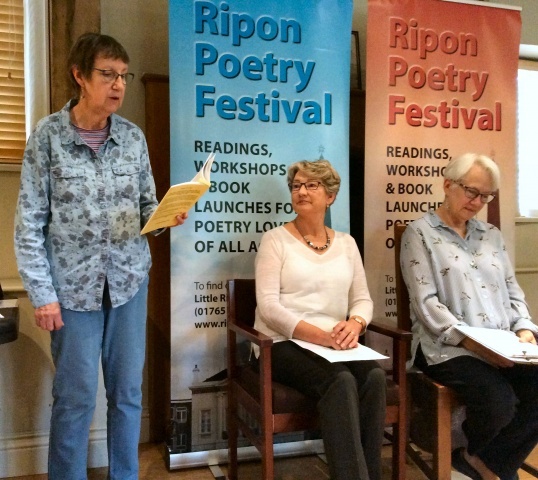 Ripon Writers’ Group was well represented over the weekend. 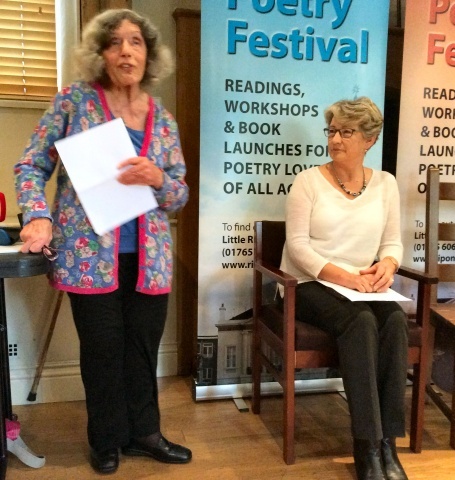 On Sunday afternoon, we had our own session at Thorpe Prebend House, chaired by Sheila Whitfield and Kate Swann. 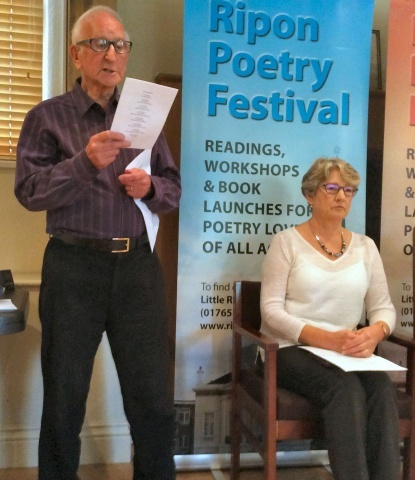 Several members read their own work and, in several cases, poems submitted by those unable to be present. Please click on the images below to see the participants. All were well received by a small but appreciative audience. 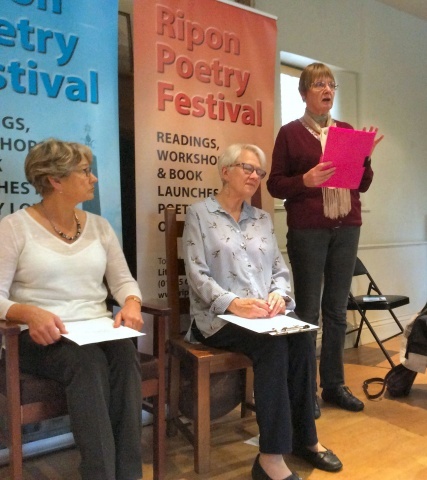 Please join us at Thorpe Prebend House, High St Agnesgate at 3.30 p.m. on Sunday 14th October. No booking required for this FREE event and everyone is welcome! 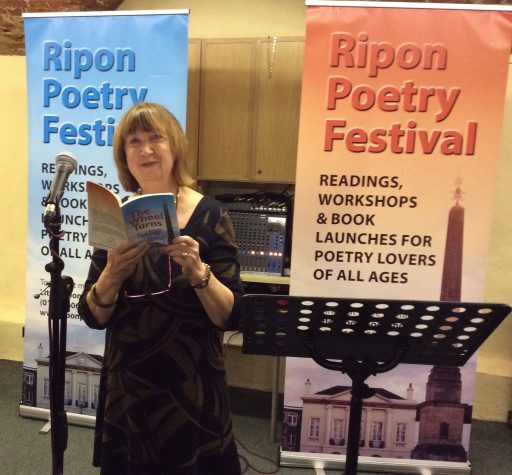 We shall be showcasing the work of some of Ripon’s best poets. 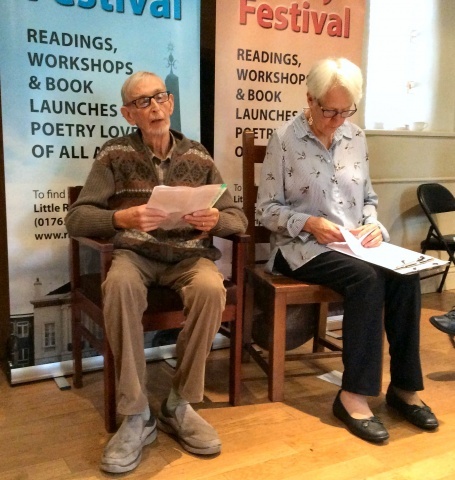 Some of our members are also featured in the Festival Competition Anthology Launch, which will take place the previous evening from 7.30 p.m. in the Undercroft of Holy Trinity Church. £5/£3 entry. At Sheila’s invitation, Susan introduced Delphine Ruston, a former English teaching colleague of hers. 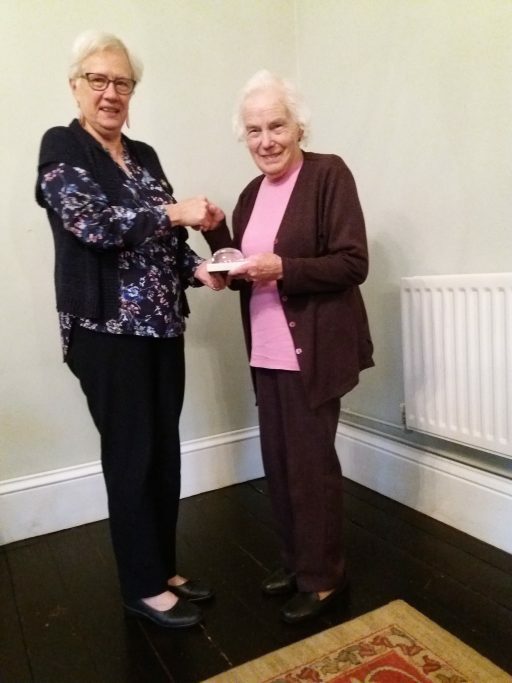 Delphine’s background includes an interest in photography, a therapeutic counselling qualification and the experience of taking groups to the Arvon Centre at Lumb Bank. 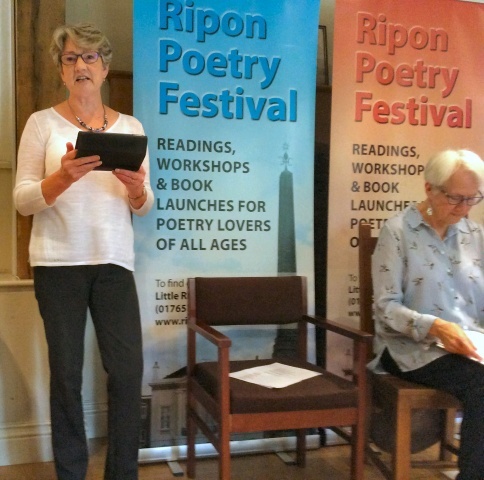 Susan felt she was suitable for the adjudicator role because she is interested in words, people and ‘how things seem’. 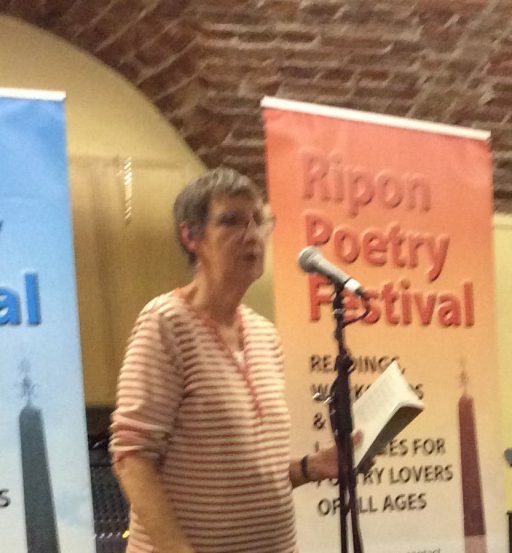 Delphine began her adjudication by saying that the invitation had come within a few days of her recent retirement. It had proved to be an enjoyable task. Her own writing is focused at present on writing a memoir of her grandmother which she wants to publish as a handmade book. (This has now aroused her interest in bookbinding.) After that she wants to write creatively. 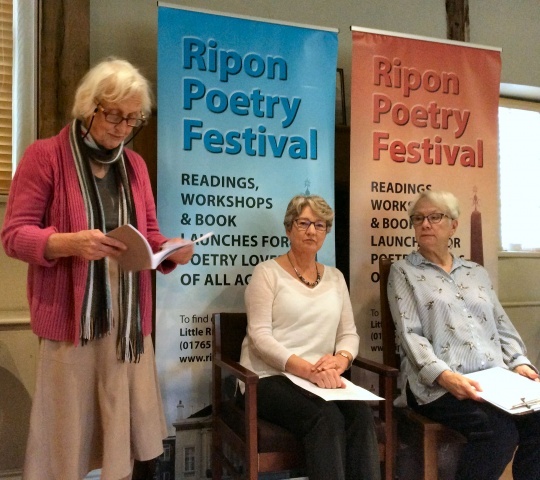 In the course of her comments she referred to and read from Philip Pullman’s book ‘Daemon Voices’. •	The quality of the idea – was it imaginative? Did it pique interest? •	A short story that lingered – did it have a poetic quality? •	Coherence and craft skills such as leanness and economy in the use of words? •	The impact of the ending – was it perhaps satisfying or unnerving? •	In choosing the subject matter, don’t be frightened of the inconsequential. The subject matter does not have to be weighty. Peter and Sheila shared the trophy. After the break the three winning stories were read. 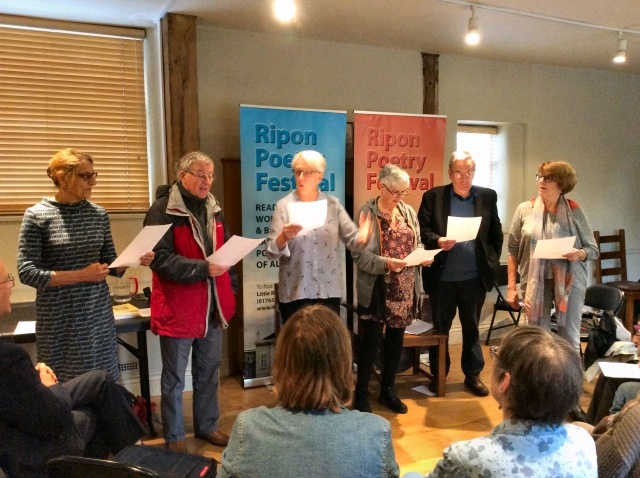 ‘“Venus Must Have Heard My Plea”’ is a tale of the semi-retired Roman Gods and Goddesses taking over the Big House in a twenty-first century Yorkshire village as a retirement home and getting involved in the lives of the locals. The title is a quotation from a Sandy Shaw hit song. ‘Beginnings and Endings’ is the story of a woman out walking her dog who discovers a corpse on a railway cutting side. It is written in an experimental format with four segments which can be read in any order. ‘Daddy Haircare’ is a daughter’s tale of bonding with her widower father as he deals with her hair. When these three stories had been read Sheila and Susan thanked Delphine for her adjudication and presented her with the usual token of the Group’s appreciation. 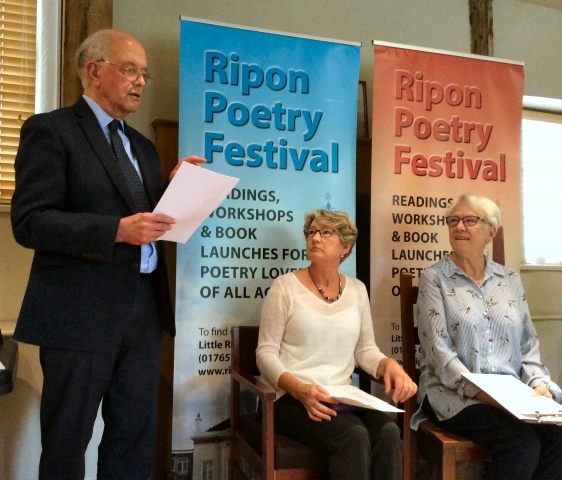 Our adjudicator on this occasion was Chris Lloyd, Chief Feature Writer for ‘The Northern Echo’ and the ‘Darlington and Stockton Times’. Well used to reading and ‘marking’ other people’s writing, he stressed the importance of grammar, spelling, structure and style. 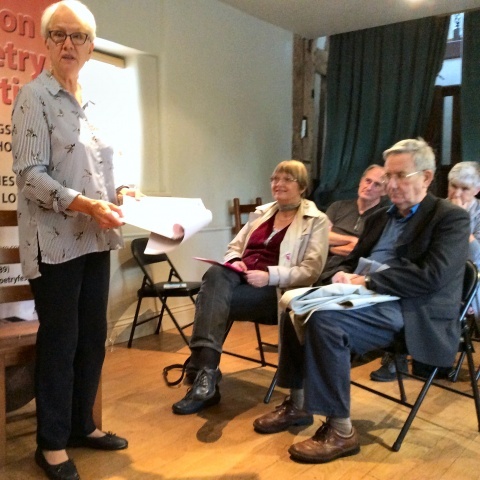 •	1st – Janet Barclay with ‘The Rise and Fall of the West Gallery’ – an account of the galleries provided in churches for musicians accompanying services. 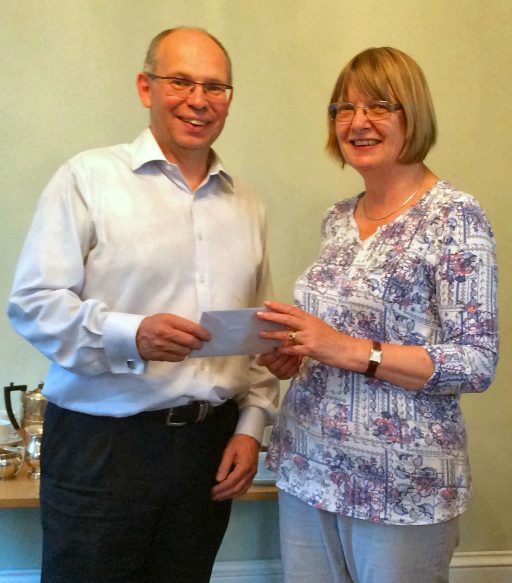 As Janet was not present, the second and third placed entries were read out before Chris was thanked by Susan (Competition Secretary) and given a token of our appreciation. 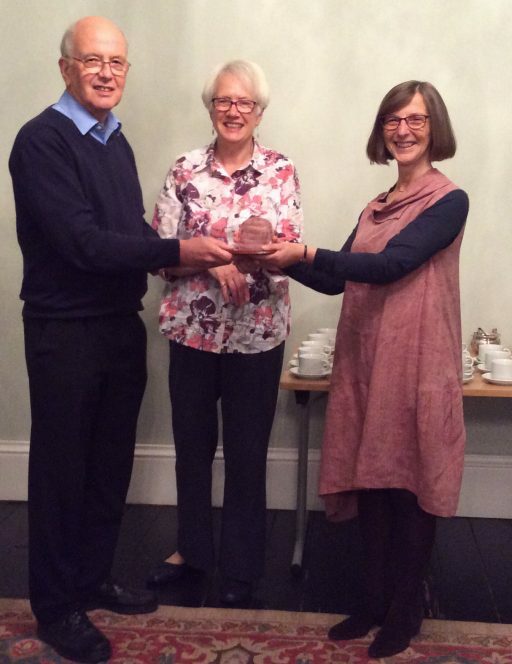 The photo above shows Janet being presented with the Mary Rawnsley trophy at the first possible opportunity after the adjudication. 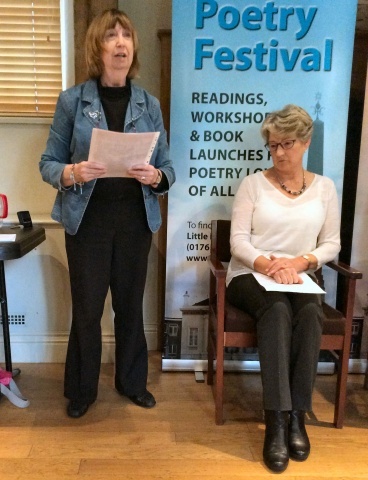 Sheila introduced Georgia Duffy, published author and owner of the ‘Imagined Things’ bookshop in Harrogate and invited her to address the meeting. Georgia said she was a big reader as a child, but it wasn’t until she’d attempted several novels that she discovered the story she really wanted to write, which became her book ‘Futurespan’, published in 2016. Its publication was a result of Georgia approaching a ‘hybrid’ company called ‘Britain’s Next Bestseller’. She successfully pitched her book to them, and it was promoted on their website. She then faced the challenge of raising more than 250 pre-orders before they would publish her book, which she did. Other forms of ‘crowdfunding’ were available to would-be authors, but she felt it was still quite an alien concept in the publishing world. Georgia talked candidly about the day-to-day business of running a bookshop – certainly not the dream job people sometimes thought it was. 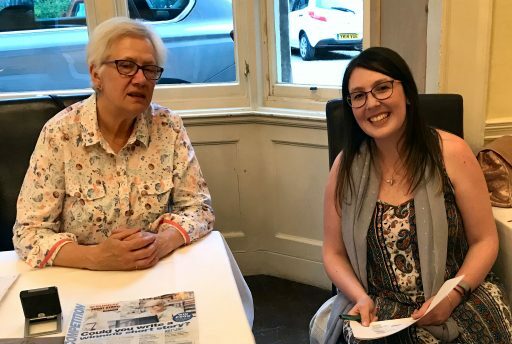 She mentioned the difficulties of compiling booklists, dealing with damaged goods and next-day ordering systems, as well as the need to keep abreast of what is being published while assessing what her customers might want to buy. Fortunately she has been able to rely on the support of other independent booksellers, and continues to work hard to establish her shop. After the coffee break Georgia answered questions. A vote of thanks was proposed by Susan and members showed their appreciation in the usual way.